This morning I was at the gym and watching Turner Classic Movies. “Comet Over Broadway” was on and Kay Francis and I suffered together, but in very different ways: I had the treadmill set to 7 incline and Kay Francis was watching her husband be convicted for killing a man. 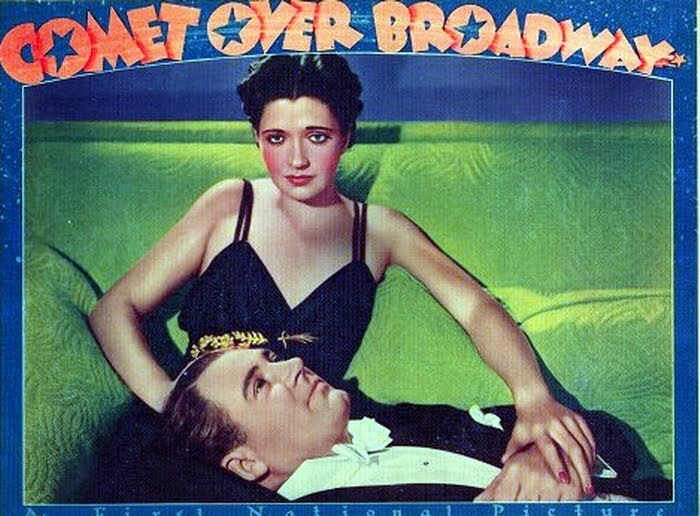 Kay Francis and Ian Hunter in "Comet Over Broadway." At this point, it donned on me that in the last year, I had never discussed how “Comet Over Hollywood” got it’s name. In September 2009, Turner Classic Movies made the great Kay Francis the Star of the Month. I’d seen Kay in movies before, but I had never had the opportunity to see her suffer like I did during that film festival. I had my mom tape all 40 movies they showed of hers and we watched them throughout the year until the following summer. I originally made my blog in April 2009 on Blogger and it was titled “Living on Velvet” after another Kay Francis movie (another blogger had this same name so I changed mine). I was going to write about old movies and let the whole world know that they were superior. But my posts were few, long and lame. I wanted to change things up and be creative: No more 3,000 word movie reviews but now rantings about Katherine Hepburn and washing my hair with champagne. And so “Comet Over Hollywood” was born. This entry was posted in Comet Archives and tagged Comet Over Broadway, Kay Francis by Jnpickens. Bookmark the permalink. Turner Classics at the gym? I don’t believe it! I need to join a gym that has this channel! I’d be working out everyday! Love your story about your blog’s evolution. I also just adore Kay Francis. I think I’ve seen all of her movies now — Comet Over Hollywood is a good one because of Ian Hunter too — love his voice! If you don’t mind, why do you like WordPress better? I’ve never tried it and just wondered. Kay Francis really is great!